Less than half of all working-age Italian women are in employment, with only South Korea, Japan, Mexico, Portugal and Turkey having a worse gender balance among OECD countries. Alessia Forti examines the obstacles that prevent women from entering the workforce in Italy and what can be done to redress the balance. The global recovery appears to be underway now, and still less than half of all working-age Italian women go to work. 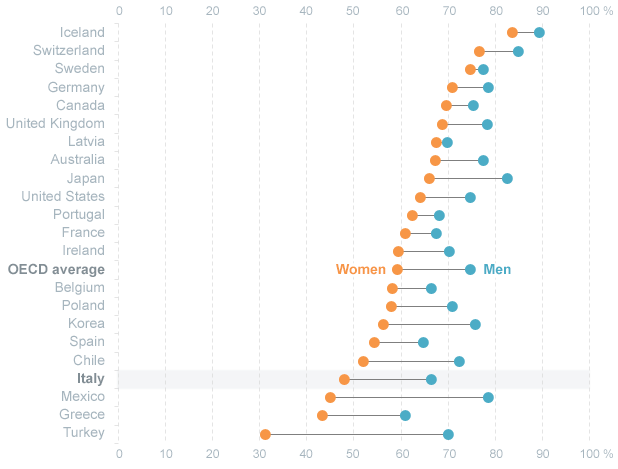 This is the worst gender balance among OECD countries after Korea, Japan, Mexico, Portugal, and Turkey. There are several reasons for this and one of them is the time women spend doing unpaid work. On average, women in Italy spend a little more than five hours a day cleaning, doing laundry, cooking, and taking care of children. Italian men spend an average of just above two hours a day on the same. Even when women do manage to get a job, it is not easy for them to reconcile work and family life. As in other countries, childcare can exacerbate existing inequalities at home. Alas, Italian legislation does not do much to help parents equally share these duties. Paternity leave lasts only two days in Italy, the shortest in OECD countries, where it can be two weeks or longer. And while it is true that Italian fathers are entitled to several weeks of parental leave, only 1 in 10 take it. Few children (aged 0-2) are enrolled in formal early education and care. It also falls on women to take care of older relatives. Over a fifth of the Italian population is aged 65 or above,­ the highest in the OECD after Japan, but adequate and accessible long-term care services for the elderly are often lacking. Holding a full-time job can be difficult if you have to take care of children and older family members with little help. International experience shows that a good way for women to combine work and family life is to have flexible work arrangements, such as part-time positions. But in Italy, part-time work is seldom used as a means to reconcile work and family life. In around 60% of cases, it is imposed by employers and often involves working on weekends, afternoons, and evenings. Indeed, Italy has among the highest shares of employed women working on Saturdays and Sundays, according to Eurostat. Italy has recognised these problems and is now working on boosting job opportunities for women. The previous government stepped up efforts to increase the availability of childcare facilities and help families meet the cost of childcare through bonuses, vouchers, and other types of subsidies. To stimulate demand and job creation, tax exemptions have been introduced for firms hiring women who have been unemployed for a long time, who live in disadvantaged areas, and who work in economic sectors with large gender occupational gaps. These family-friendly policies are steps in the right direction. Hopefully, in the longer term they will generate a much-needed shift in attitudes and reduce stereotypes about the role women play in the labour market and society at large. Note: A version of this article was originally published at the OECD Insights blog. The article gives the views of the author, not the position of EUROPP – European Politics and Policy or the London School of Economics. Alessia Forti is a Labour Market Economist at the OECD Directorate for Employment, Labour and Social Affairs.